I was born in St. Louis, MO, and while I was a ceramic student in 1995, I discovered my true passion was in hand blown glass and never looked back. In 2002 I graduated with a Bachelor of Fine Arts in glass concentration from California College of Arts and Crafts in Oakland, California. 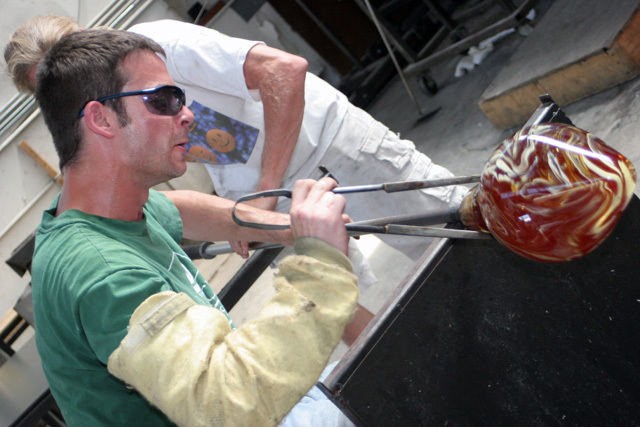 During the course of my training, I have toured the United States exploring glass studios. My experiences range from: Inferno Glass Studio in New Orleans, Louisiana to Pilchuck Glass School in Seattle, Washington. Internationally, I had training in glass blowing in Murano, Italy. It has been my honor to have had the experience of blowing glass with these famous glass artists: Dante Marioni, Lino Tagliapietra, Hank Adams, and Clifford Rainey. In 2006, I designed and built Slow Burn Glass LLC, a 2300-square-foot glass studio in Oakland, where I created my work until July 2018. Slow Burn Glass then expanded into a 5000-square-foot facility in Richmond, CA. Here I have excelled in many forms and styles which include the use of clean lines and superior craftsmanship. Using my past experiences to influence these styles, I spend a lot of time developing my own colors that transform into one of a kind works of art! There is nothing I enjoy more than blowing glass. The continuing emerging quality that occurs in my pieces is the use of color and clean lines. My designs now take form as functional vessels, such as bowls, vases and platters. Aesthetically each piece can stand-alone or become part of a larger cluster of pieces. May each of my pieces give you as much pleasure as I have had in creating them for you.